More than six centuries have passed since the first stone of Milan’s Cathedral was laid in 1386, yet its construction cannot be considered completed. That explains why the Milanese love to say “it’s taking as long as the building of the Duomo!” when referring to all those jobs that never seem to come to completion. Since December 20th though, at least one major improvement can be considered complete: the Milanese and the tourists can now admire the new exterior lighting of the Duomo’s upper part, which highlights the spires’ beauty and brightens the whole square. Going back in time, the lighting of the Piazza has been another neverending story in its own right. It all started in 1929, when the Town Hall decided to illuminate just the Piazza, leaving the Duomo in the dark. Then, in 1932, a special light beam was projected towards the Cathedral just to impress Mussolini on the occasion of his visit. Later, in 1960, AEM (the acronym for Azienda Elettrica Municipale, that is the Municipal Electrical Company) lighted up the Duomo from December 8th to January 1st to celebrate its 50 years of activity. In 2000, AEM designed and manufactured a permanent system with ceramic burner discharge lamps (the latest generation at the time). Recently, step by step, the interior lighting has been completed, as well as that of the highest spire holding the “Madonnina” (Our Lady). Both lighting systems were inaugurated on Expo’s first day, May 1st 2015. Finally, starting from the Christmas holidays 2016, new lamps were turned on to illuminate the façade and the stained glass windows. The last stage started recently, when a large and complex project was designed to reveal details of the Cathedral’s top, bringing surprising brightness to all the spires. The new Municipal Electrical Company, A2A, took care of the installation of the new LED projectors. This required considerable effort and resources, and an investment of over one million euro. 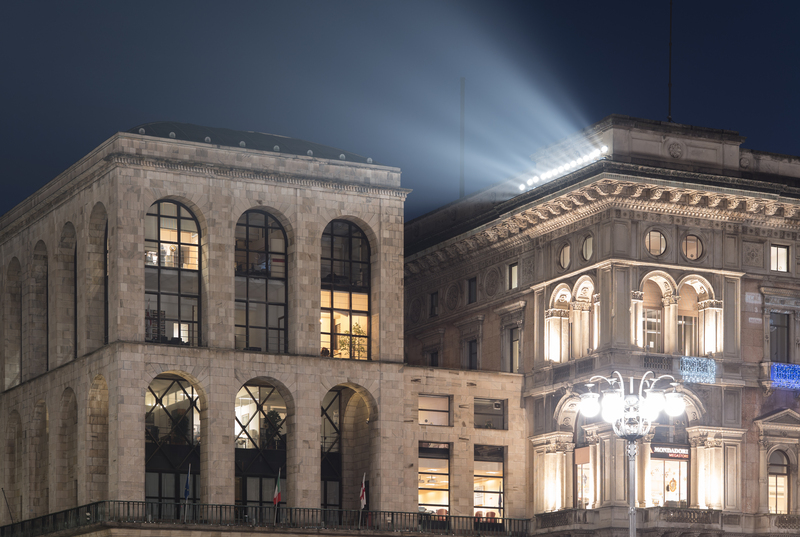 The new lighting system, arranged on several levels of the entire external perimeter, has replaced the former 378 non-LED fixtures with 574 LED projectors, 368 of which are allocated on the roof terraces and 206 placed on the surrounding buildings in strategic points of the Piazza. Among these, the 56 projectors that illuminate the main façade are all equipped with a patented and extremely precise focusing system, which guides the observer’s eyes towards the neo-gothic and neoclassical features, highlighting details and perspectives in an unprecedented way. The result is a sober and characterizing light in total harmony with the architecture. The light donates details, friezes, and statues true plasticity, to the point that even the chromatic variations of the Candoglia marble are perfectly visible. To obtain the best result and highlight the marble surfaces, the Italian designers have chosen the color temperature “LED light neutral white 4000K °”, which is perfectly uniform and devoid of any color smear. Following this choice, ERCO have specially designed state-of-the-art lighting fixtures with powerful optics that can cover distances up to 135 meters with an unprecedented precision. The special projectors, designed on specifications, have been made with technological devices and technical rigor so as to ensure that their operability will lasts for a long time, minimizing maintenance times and costs, even in the most adverse climatic conditions. 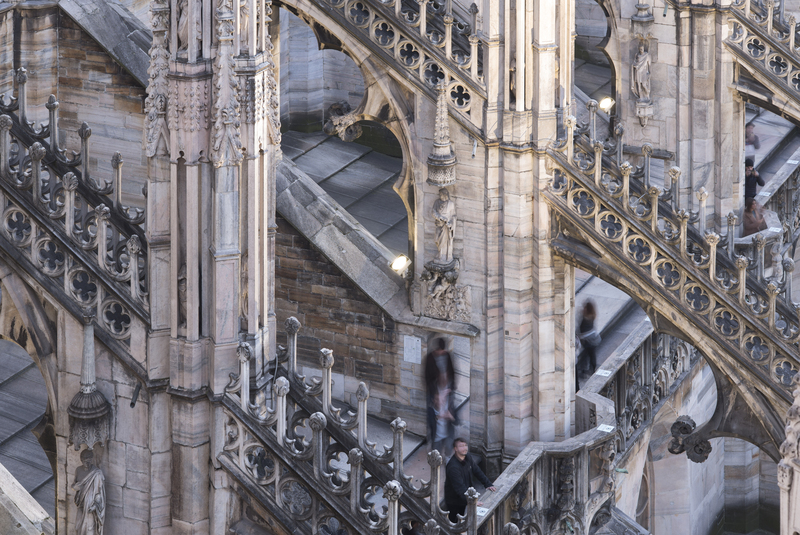 Milan’s Cathedral is now a fully virtuous model from the point of view of environmental sustainability and innovation. Not only is it connected to the district heating network, which eliminates the use of fossil fuels; thanks to the new lighting it is also one of the historical monuments with the lowest environmental impact in Europe. The LED luminaries reduce the annual electricity consumption by 52%, save 23,000 tons of CO2 emissions and 9 tons of waste. Replacing the previous metal halide lamps, the new system will guarantee an energy absorption of 30% less compared to an increase in luminance from 20 to 130 lux uniform. The very high quality standards of ERCO products, equipped with guaranteed diodes with a fallibility rate lower than 0.1% per 50,000 hours of use, have already been used in many ambitious projects in Milan, such as along the Vittorio Emanuele II Gallery and the Sforza Castle, as well as in other parts of Italy and around the world. Founded in 1934 by Arnold Reininghaus, ERCO operate globally in 55 countries through a network of over 1,000 employees and over 40 showrooms and representative offices. Since 2015, it has been producing exclusively LED lighting fixtures. ERCO develops, designs and produces all its lighting tools in Germany, focusing on the performance of its patented optical systems, on electronics, design and construction quality / durability. Unfortunately, due to the presence of building sites still active in several roofing areas, it has been impossible to install all the projectors originally planned in the project, so some areas of the upper section of the Duomo do not appear illuminated yet. 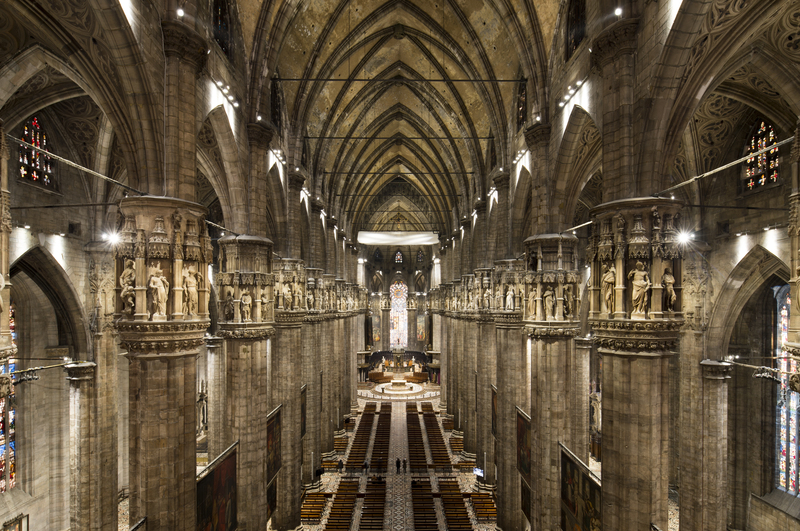 The progressive completion of restoration work will also allow the complete installation of the lighting equipment with step-by-step interventions, just to reiterate – yet again – that all jobs concerning the Duomo continue to be … neverending stories.